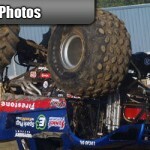 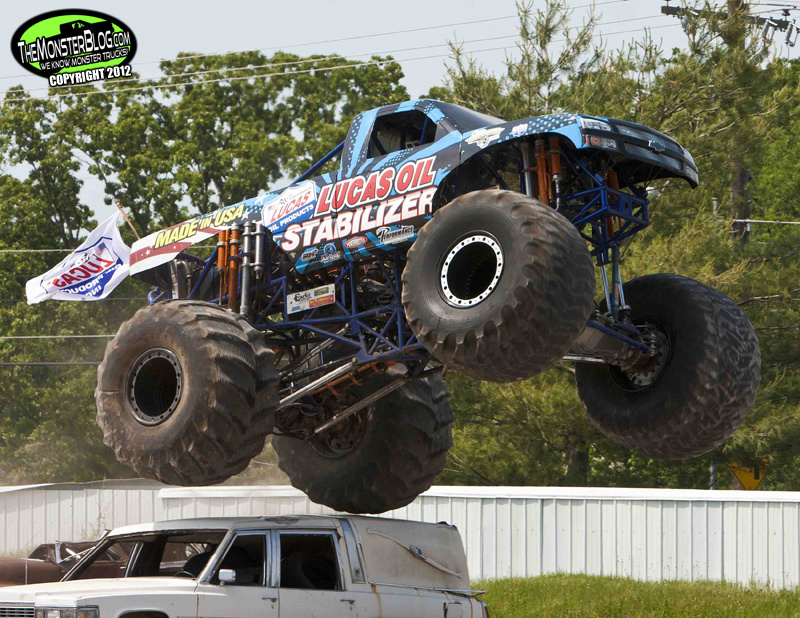 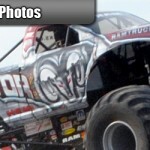 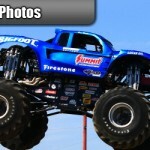 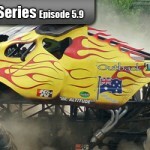 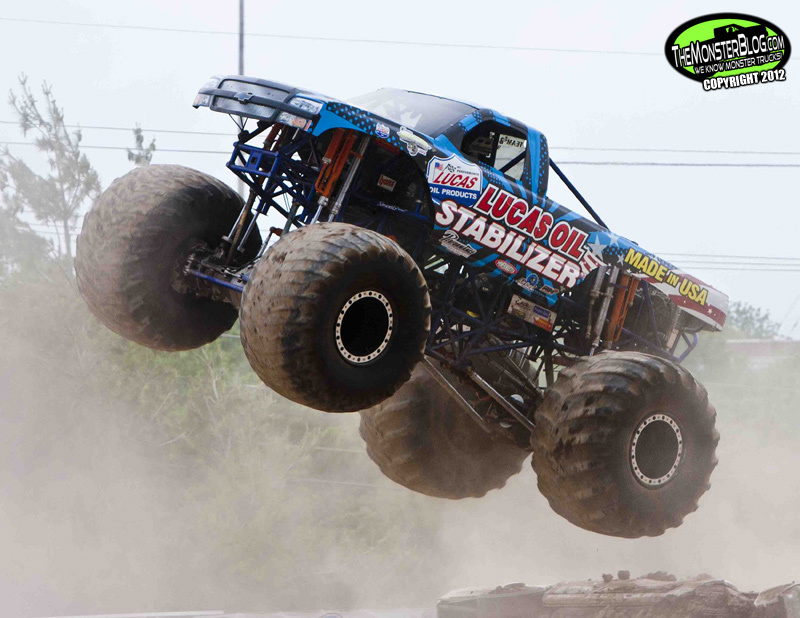 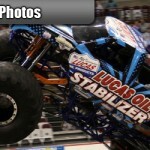 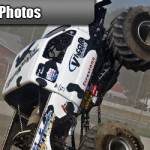 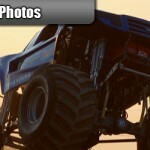 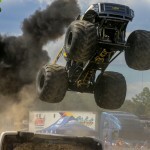 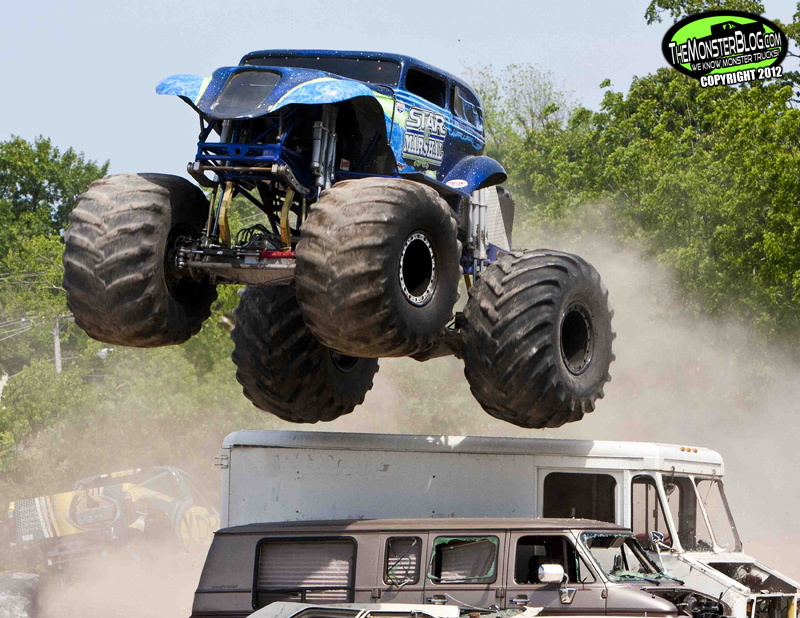 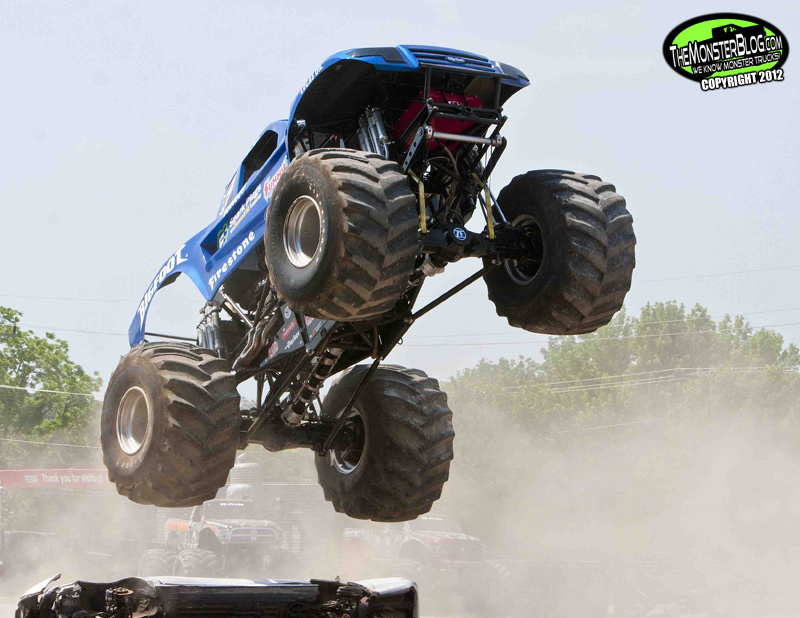 Description: Highlights from the 25th Anniversary of the Bloomsburg, PA 4-Wheel Jamboree Nationals! 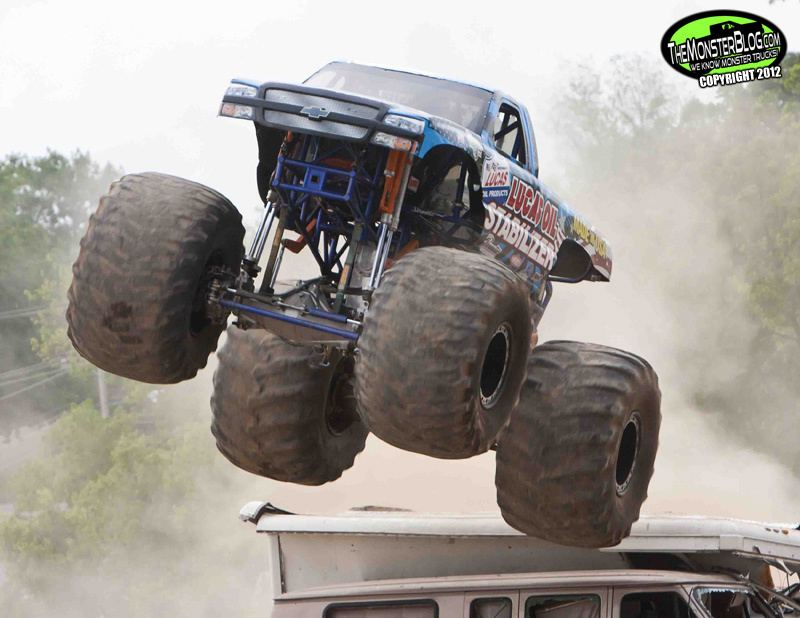 When the 2011 4 Wheel Jamboree season rolled around, Dan Runte was back and ready to stop the Hall Brothers decade long win streak. 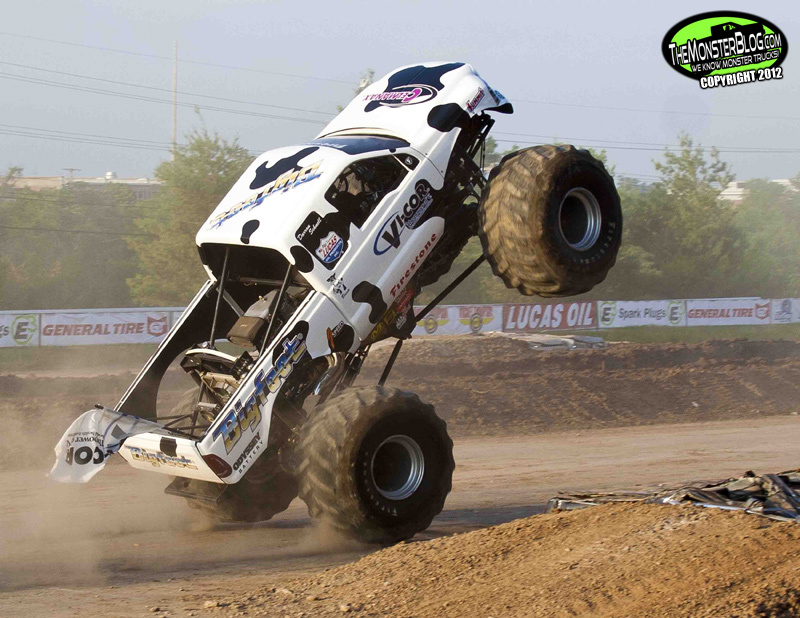 When all was said and done, Dan stood head and shoulders above the rest, bringing the trophy back to Midwest 4-Wheel Drive. 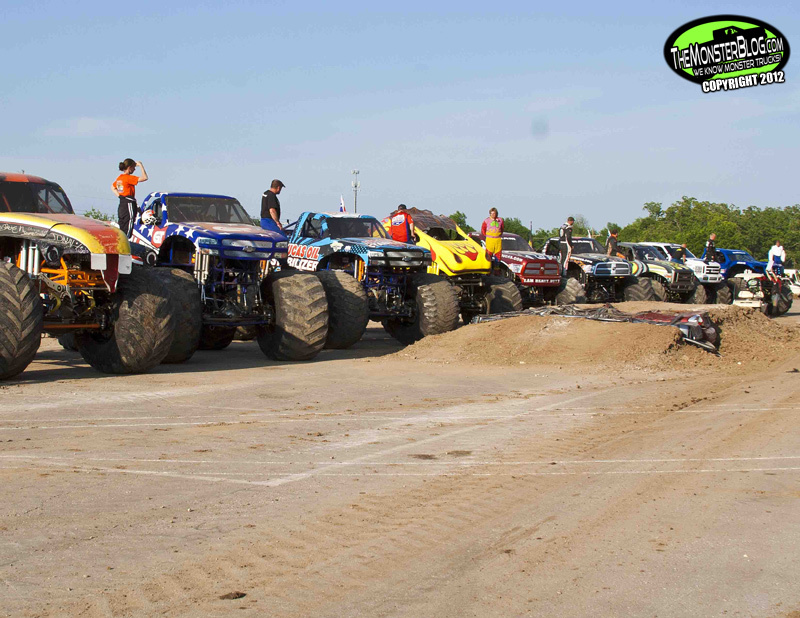 Now another battle royal for the 4 Wheel Jamboree Series Title has begun in Springfield, MO. 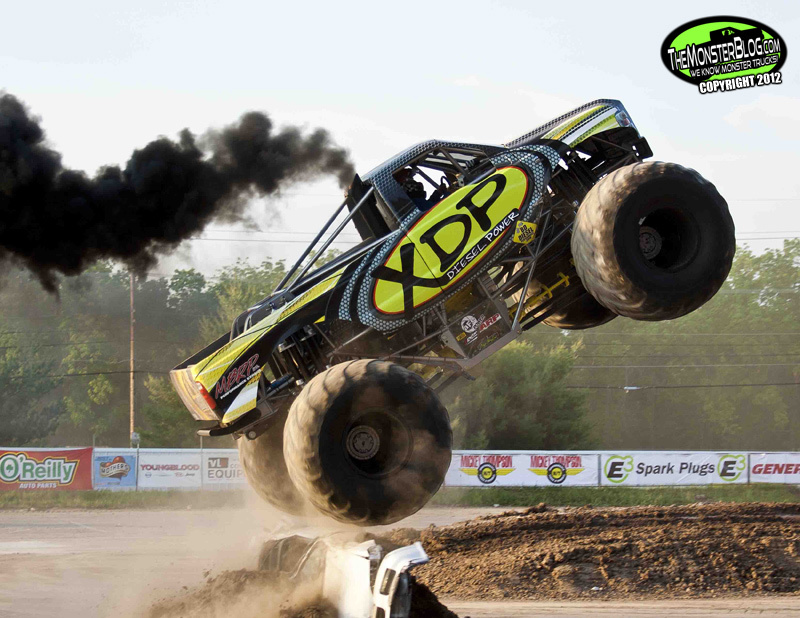 Dan Runte was driving the new E3 Spark Plugs Bigfoot #18 with sophomore season driver Darron Schnell with him in Vi-Cor Bigfoot “Bessie” #11. 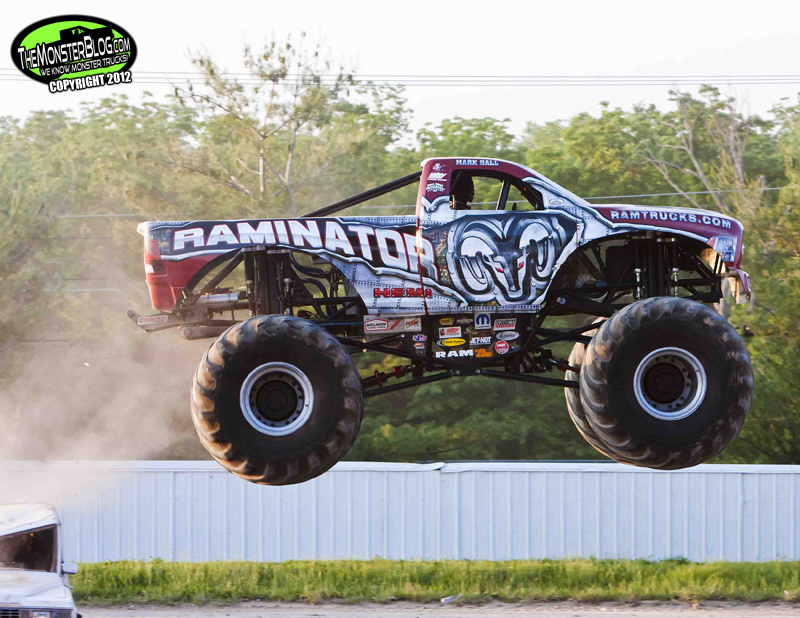 Those two went up against Mark Hall and Mat Dishman in Raminator and Rammunition. 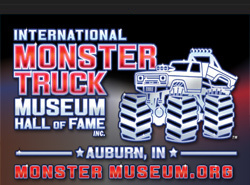 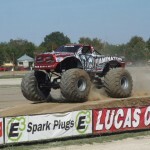 The other trucks in the field of ten were Bobby Holman in Lucas Oil Stabilizer with Michelle Simpson and Chalkboard Chuck, regular Stomper driver Joe Nichter with the General Tire body on the Ironman chassis and Dave Radzierez driving both Star Marshall and the XDP sponsored Diesel Monster Truck. 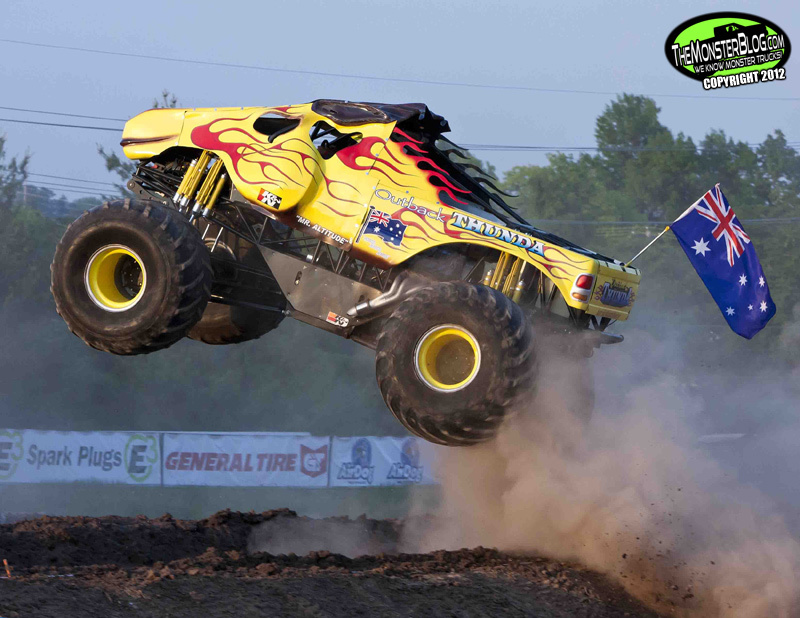 Rounding out the field was Australian Champion Clive Featherby and Outback Thunda. 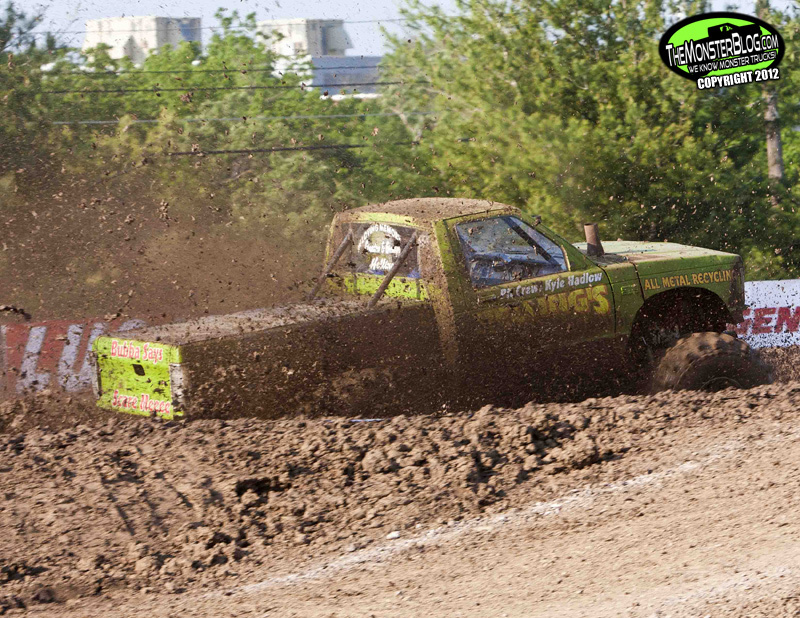 The track construction crew put together a brand new, “Double S” race course. 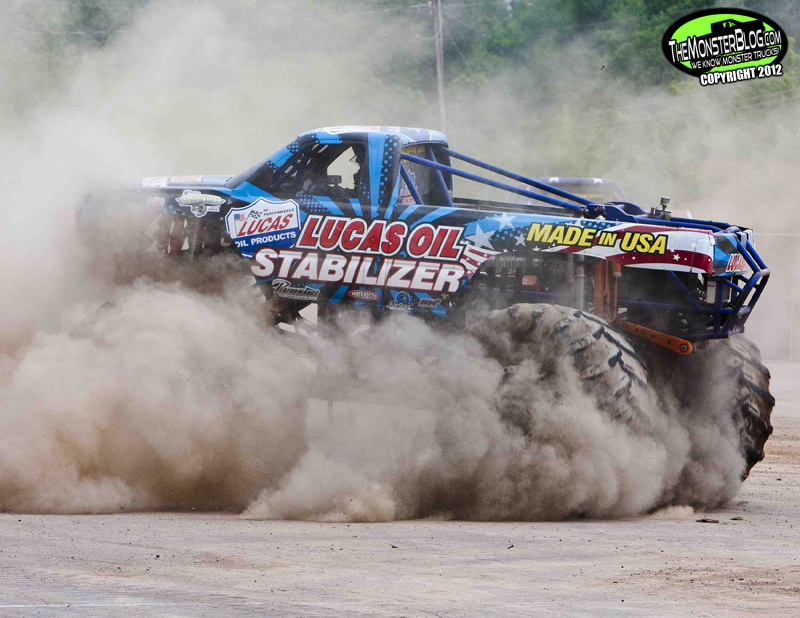 The two trucks complete half a clock-wise roundy-round lap before making a hairpin turn to the left and flying over one more jump to the finish line. 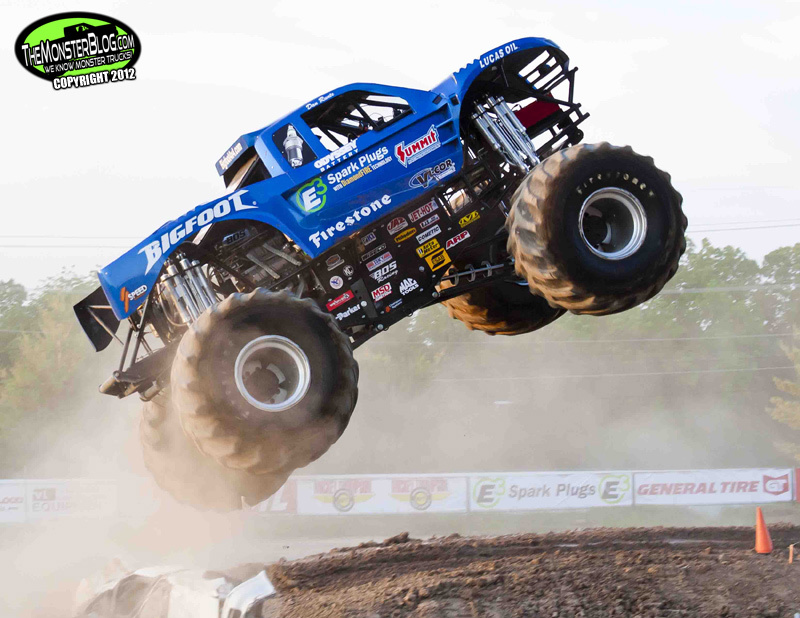 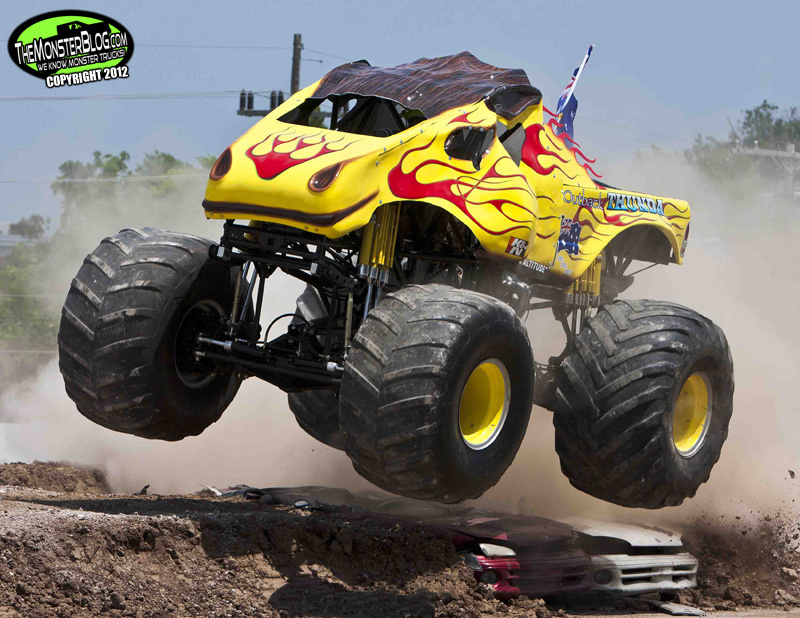 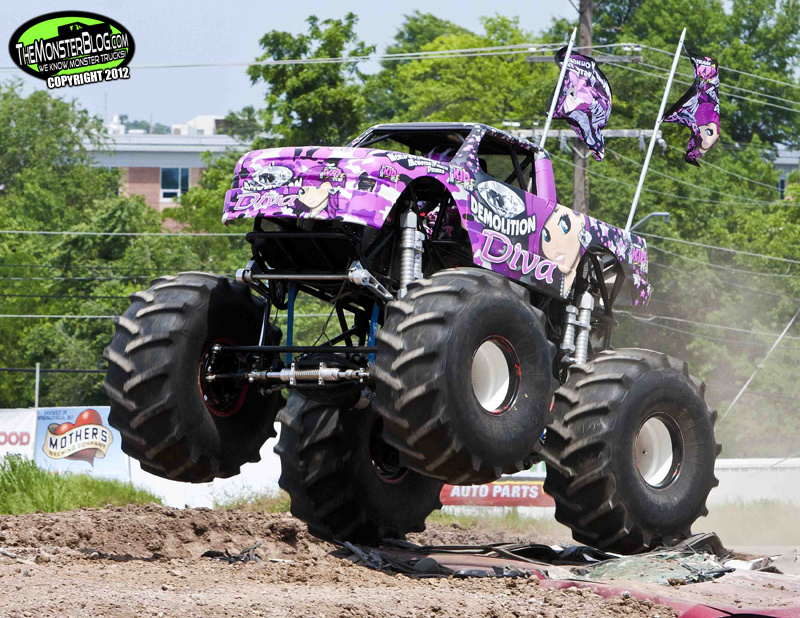 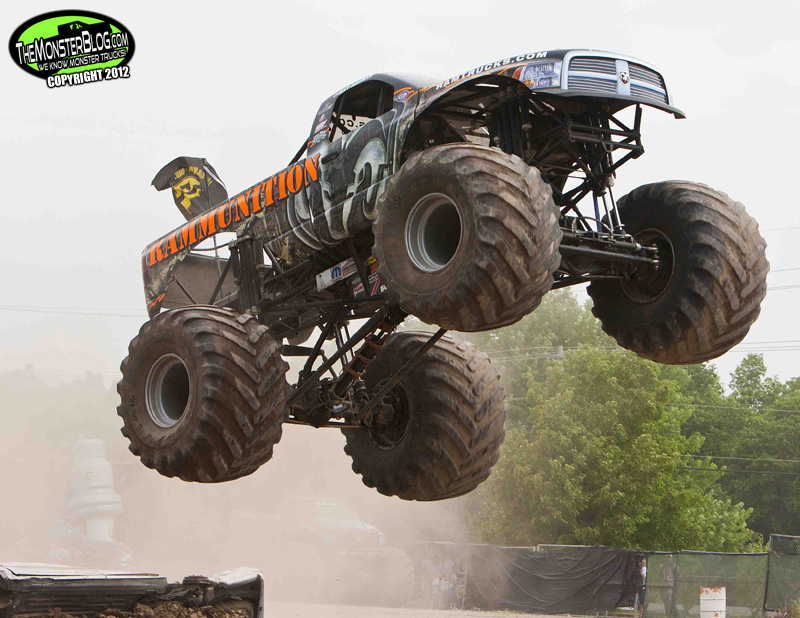 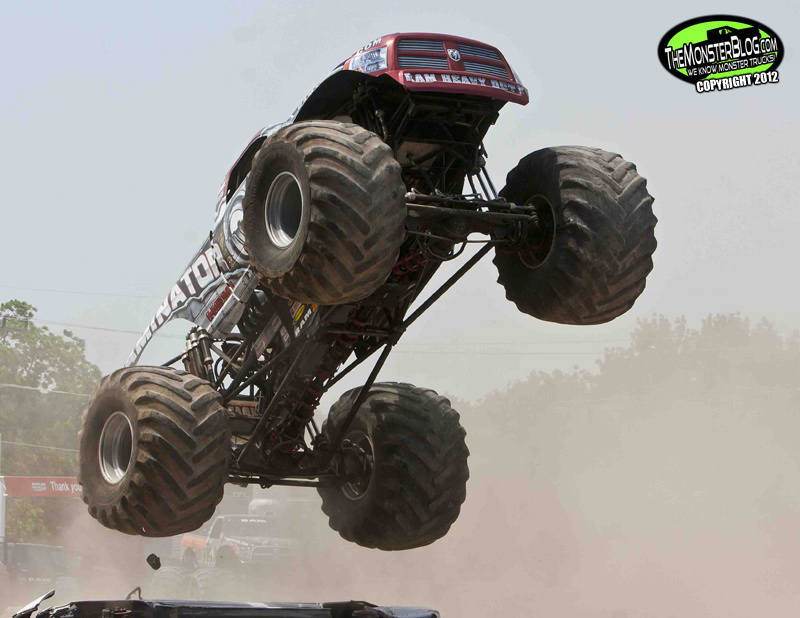 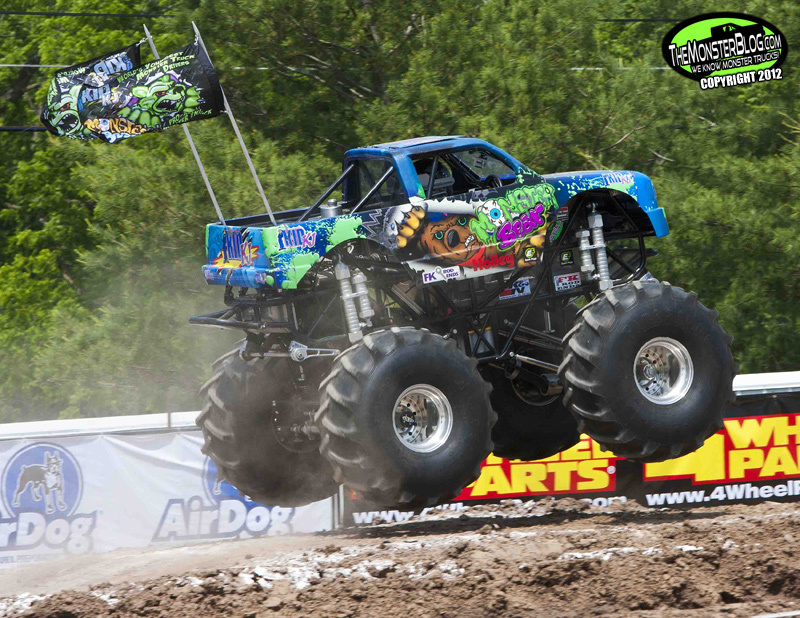 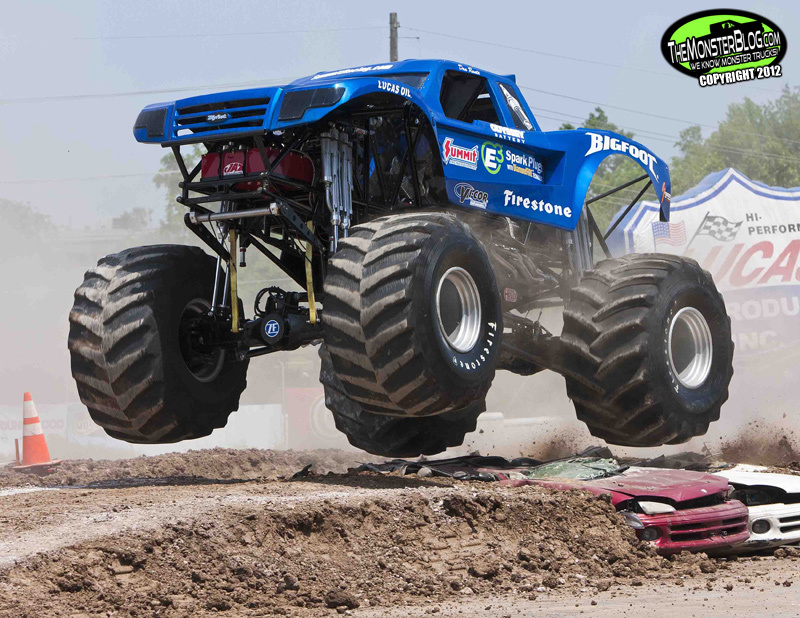 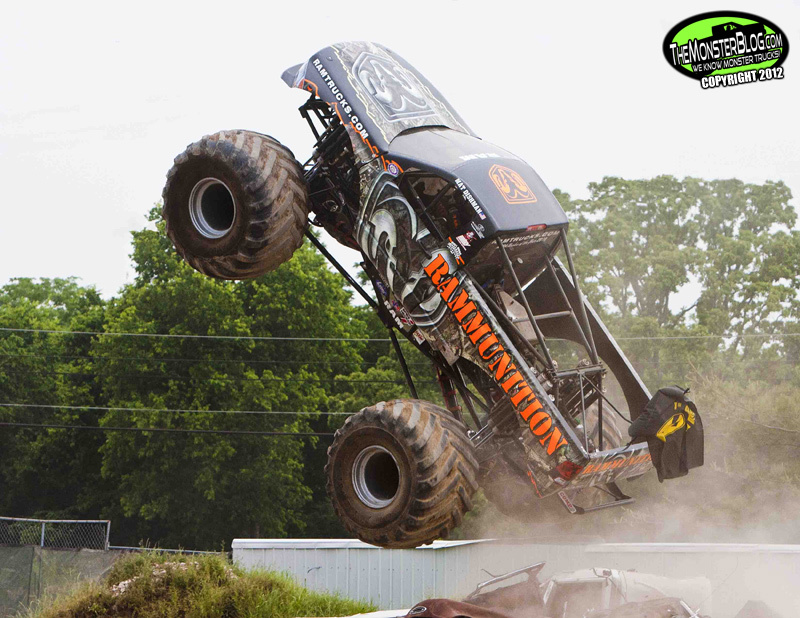 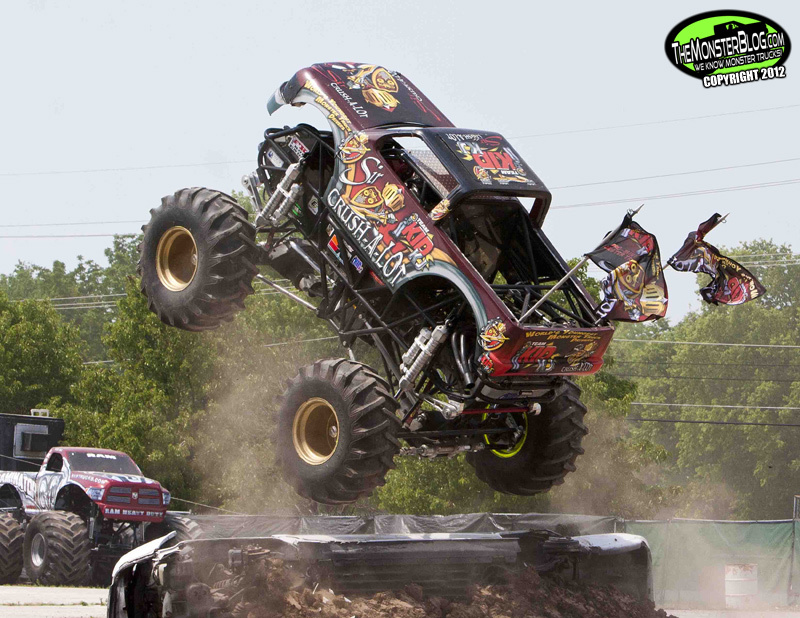 After some photo finishes, tight turns and a lot of dust, the semi-finals featured the Rammunition gunning down the reigning champion Bigfoot, while Bigfoot Bessie “udderly” embarrassed the Stabilizer. 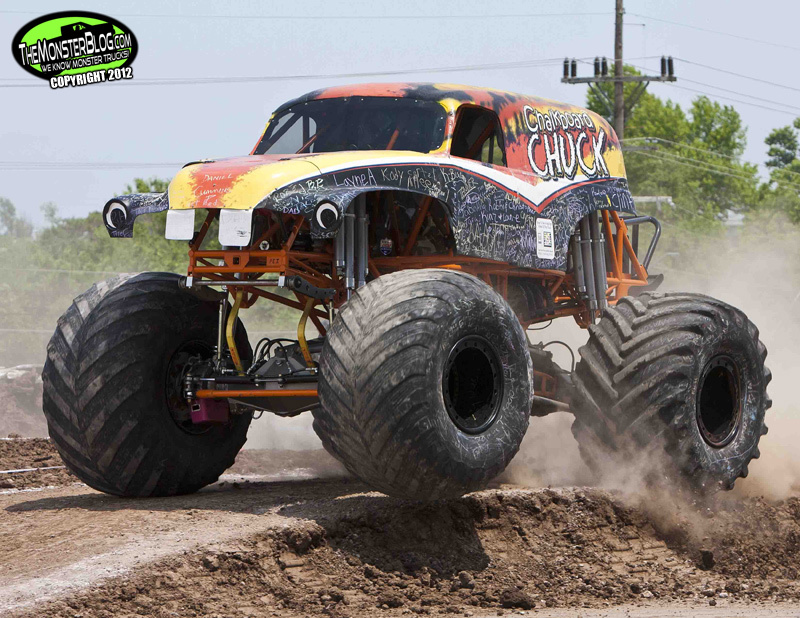 In the finale, it was neck and neck all the way to the end where Mat stood on the throttle and edged out the world’s only dairy themed monster truck by less than a truck length. 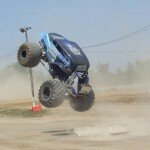 In the following freestyle and the second show freestyle (which was the only competition for the second show with no racing), no official winner was crowned, but the fans cheered on. 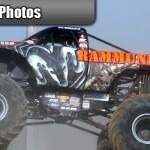 The second day of racing saw only 7 trucks hit the track for the afternoon and only show on Sunday. 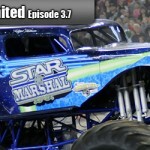 Star Marshall gave up his two front tires to make up for a broken rim on the Stabilizer. 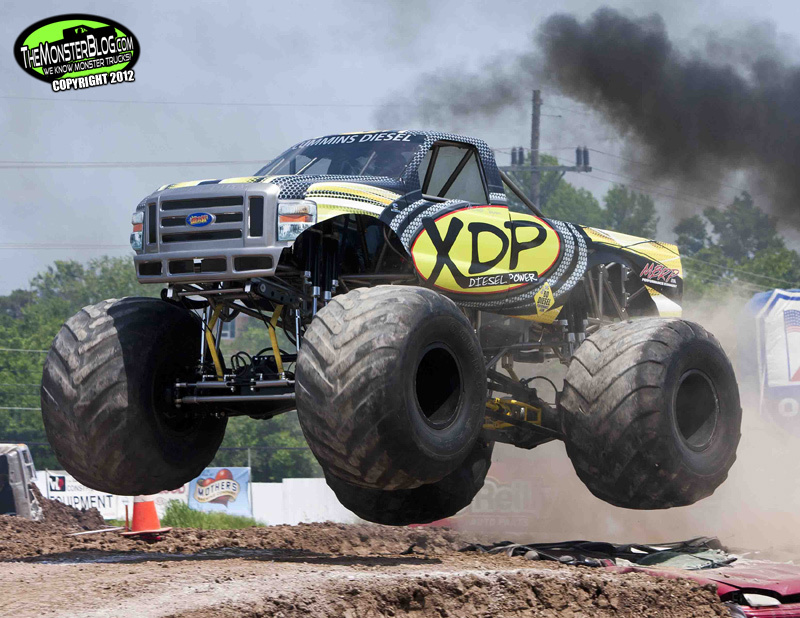 Bigfoot Bessie had blown a motor the night before during freestyle and the XDP Diesel had some gear problems that were fixed but a steering line was also broken with no chance of being fixed in time. 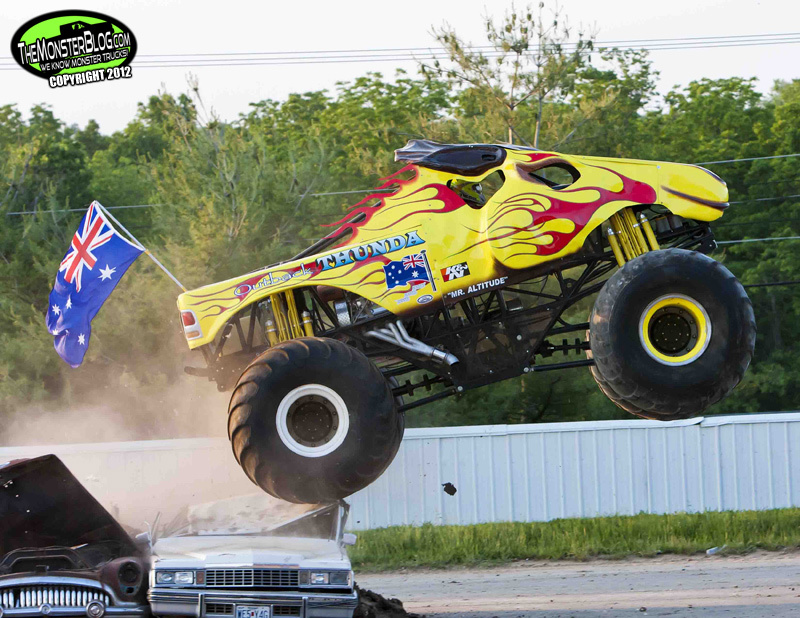 In racing, the Aussie legend went head to head with the American legend Bigfoot #18 in the first semi final. 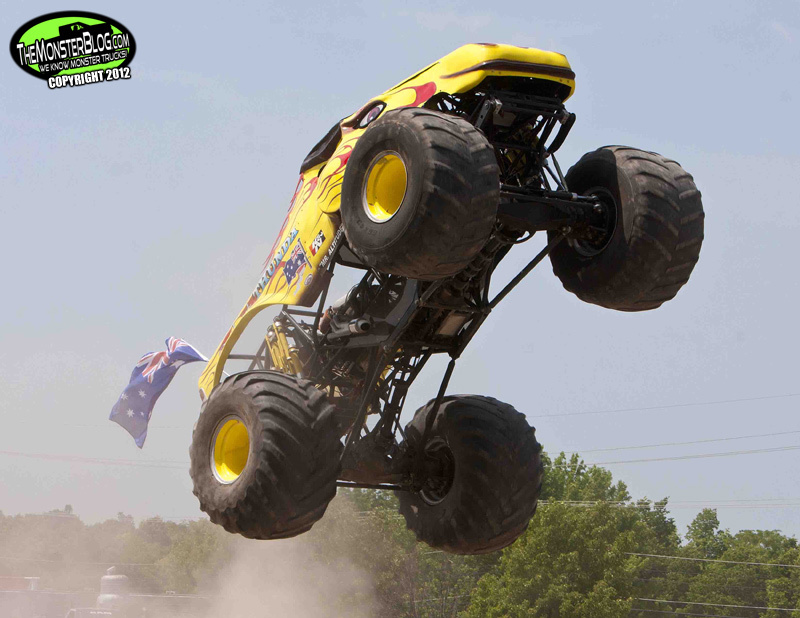 It was neck and neck until Clive spun out in the final corner leading up to the final jump. 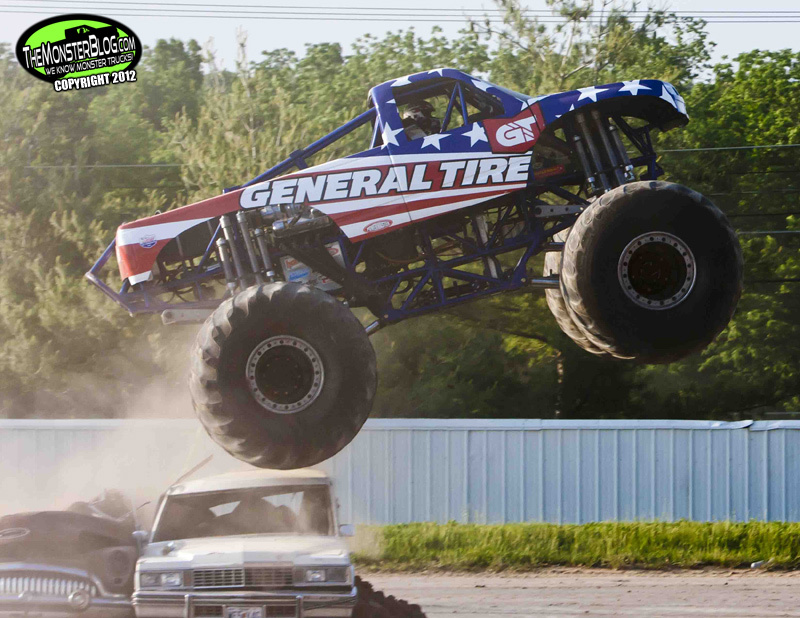 Mat Dishman demoted the General and 20 plus year veteran Joe Nichter in the other semi to put together a classic Hall Brothers/Bigfoot finale. 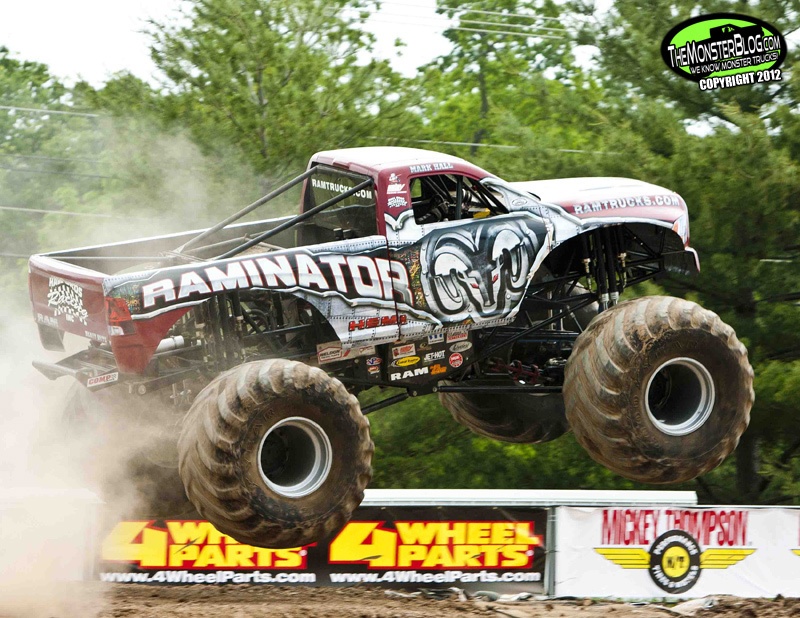 For the first two-thirds of the race there was no clear leader until Bigfoot went into the final corner too hot, giving the Hemi powered Rammunition the weekend sweep. 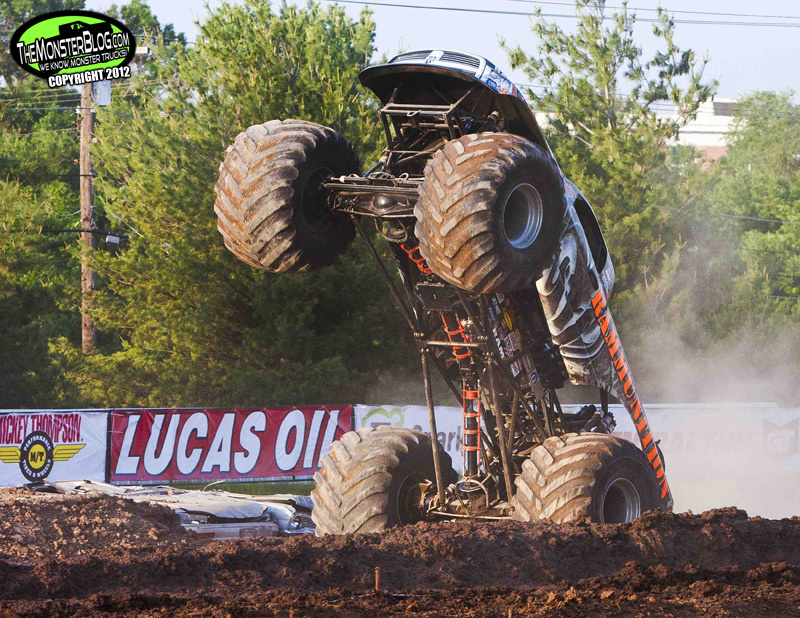 Like the night before, there was no winner in freestyle. 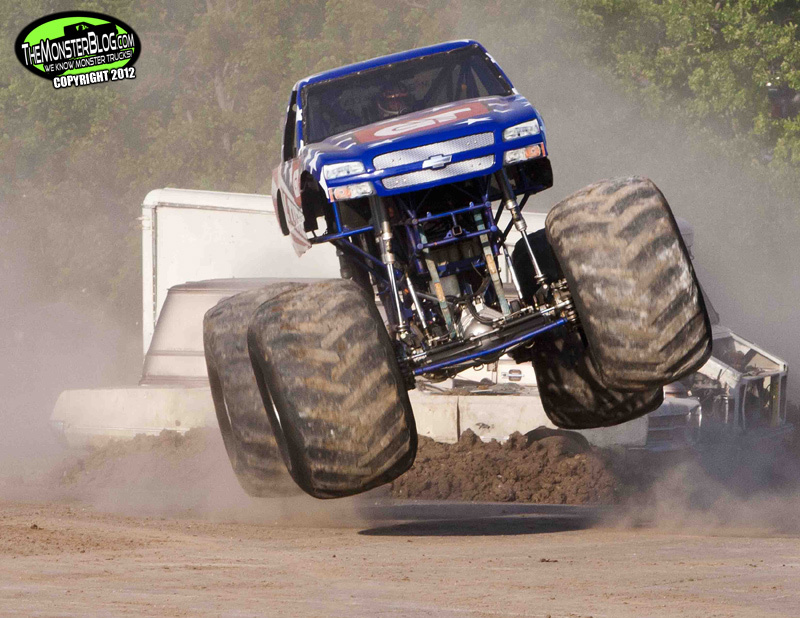 But the best runs of the day belonged to “Horse with Attitude” Outback Thunda and the 10 time champion Dan Runte. 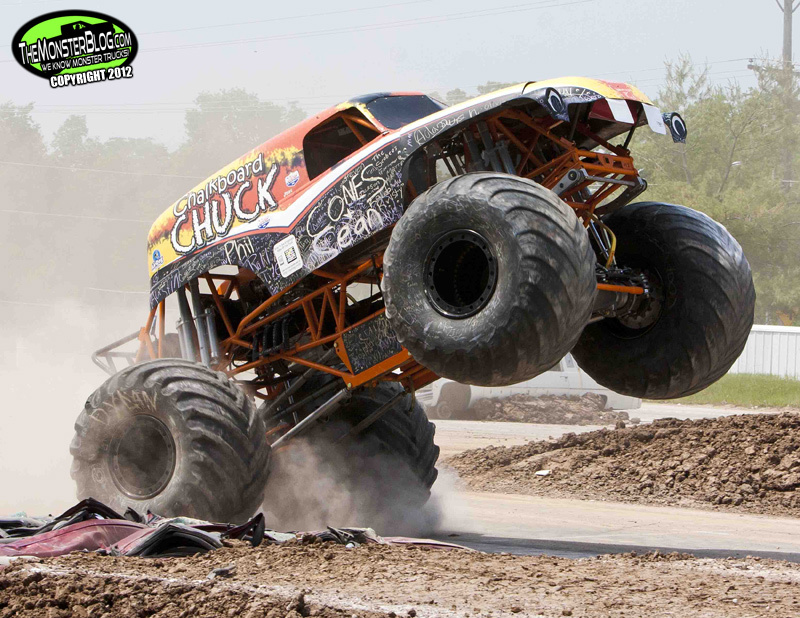 Both drivers pushed their trucks to the limit, much to the increasing noise from the crowd. 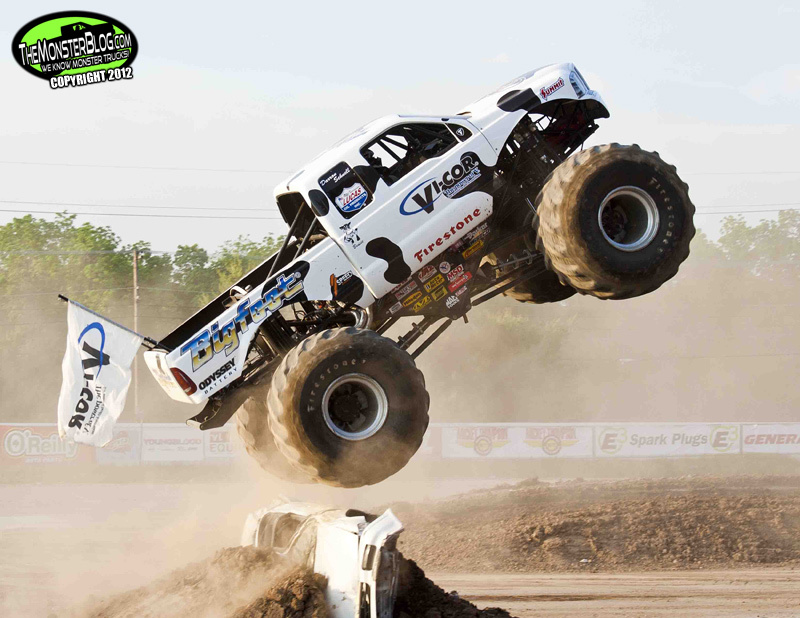 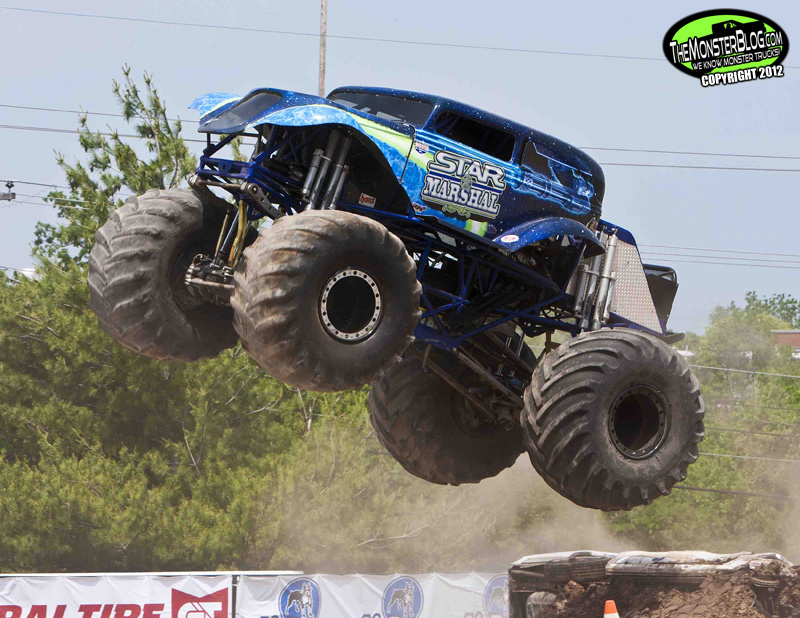 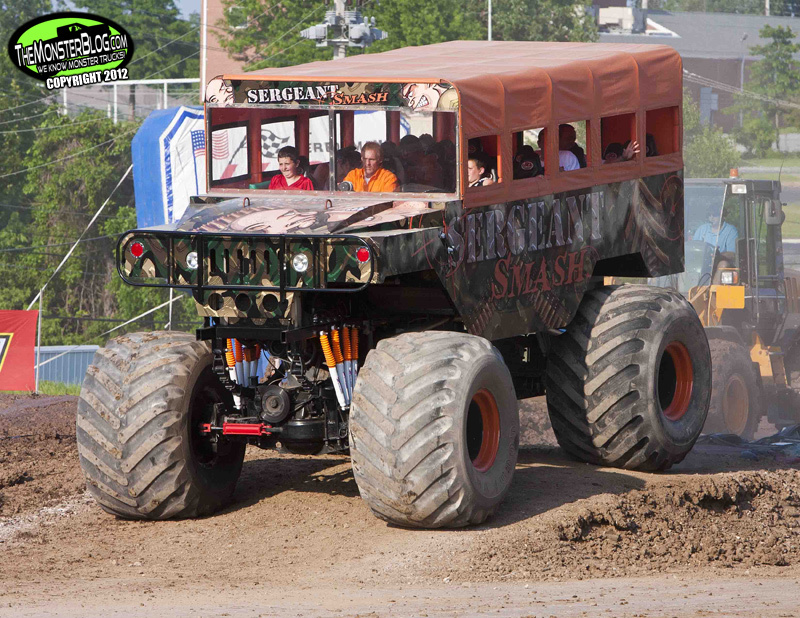 Throughout the weekend, the Sergeant Smash ride truck gave rides to anyone who wanted one and Kid KJ & The Lil’ Mighty Monsters both raced and gave freestyle runs, showing the future of the monster truck industry looks bright. 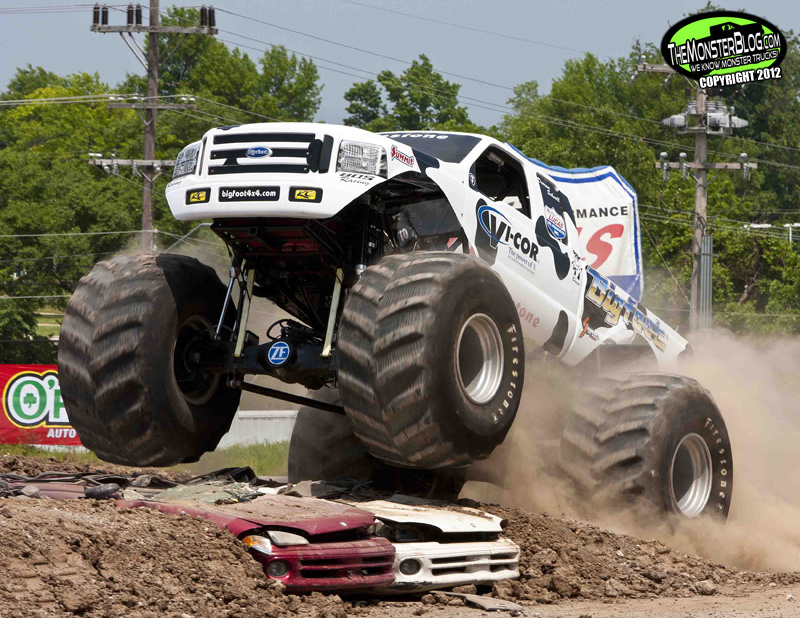 With two Bigfoot/Hall Brothers battles in two races, this reporter is confident that the rivalry can only get hotter as the season winds down. 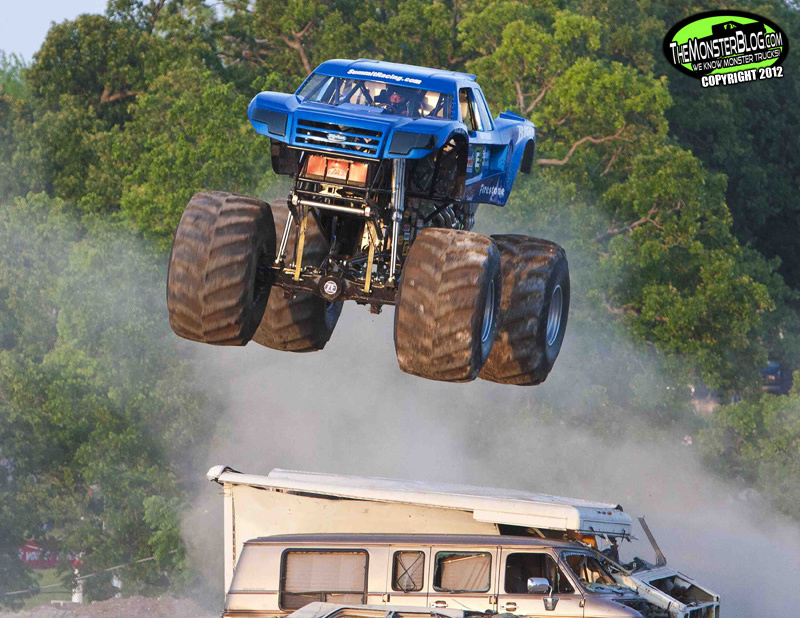 Right now: Hall Brothers 2; Bigfoot 0. 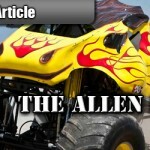 Next stop for The Allen Report is the San Diego County Fair in Del Mar, California over Independence Day weekend. 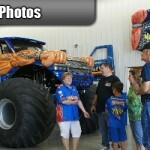 In the meantime, thanks to Family Events for their hospitality, enjoy the photos, thank you for reading and cheer on!